“We’re not using it on my land,” he says. 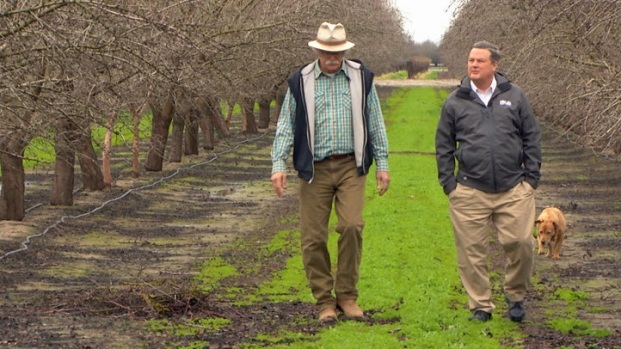 Like two generations before him, Tom Frantz has been growing almonds near Bakersfield all his life. He doesn’t want to use oil waste water on his trees. Produced water comes from the Kern River Oil Fields a few miles to the east. It’s a byproduct of extracting oil. To extract one barrel of crude out of the earth, oil companies use between 10 and 100 barrels of water. That water is then filtered through tanks that contain crushed walnut shells, which adhere to the oil. The water then travels into ponds where it is skimmed to remove oil from the surface. If necessary, the water returns once again to the filtering process before being blended with fresh water. It then travels down canals where it is delivered to about 90 farms in the Bakersfield area. Farmers in the area are using more than 20 million gallons of this water each day. Oil companies and the Cawelo Water District have tested the water and assured the farmers that the water is safe. Those farmers sell their produce to the Bay Area and throughout the country, sometimes as organic products. Shonkoff and a team of scientists from UC Berkeley, Lawrence Berkeley Labs and PSE, an Energy Science Institute – have recently completed a report that identifies the chemicals and their toxicities. While they couldn’t analyze the chemicals classified as trade secrets, with respect to the rest of them, Shonkoff says, “Forty percent of those rise to the ‘chemicals of concern’ category. A total of 10 chemicals from the list were classified as either carcinogenic or possibly carcinogenic in humans by IARC, the International Agency for Research on Cancer. 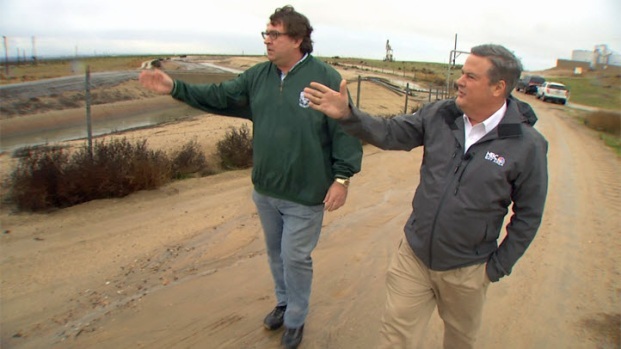 Scott Smith from Water Defense and Reporter Stephen Stock survey the ponds where oil waster water collects before going out to farms. In fact, food from the Central Valley is shipped all over the United States, producing eight percent of the nation’s agriculture. “Protecting people and the environment is one of Chevron’s core values. See complete Chevron statement here. 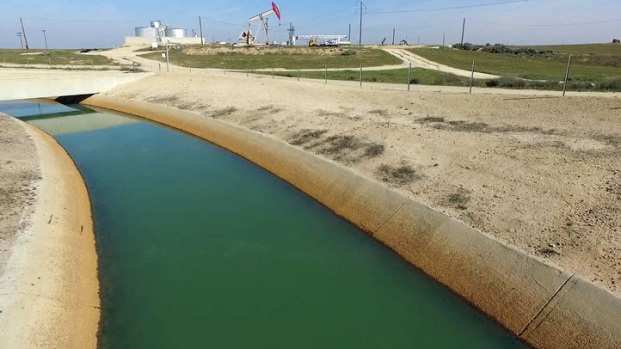 The Cawelo Water District says they are continuing to do monthly and quarterly tests of the oil waste water and that so far - all tests show that it’s safe for irrigating crops. 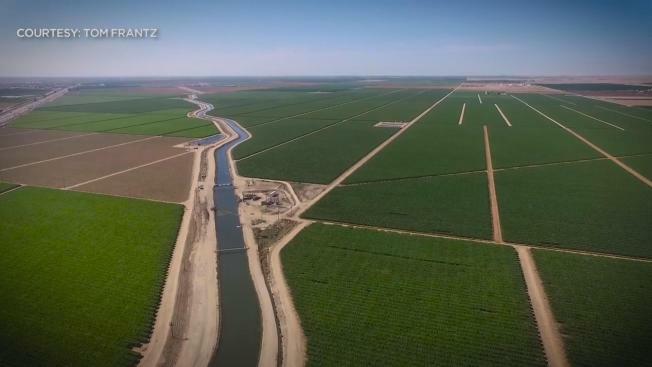 But Tom Frantz, the longtime almond farmer, isn’t convinced: All they can say it hasn’t been proven definitively to be dangerous yet, so let’s continue. That’s what they’re saying. They’re telling us: prove it’s dangerous and we might stop. A canal in the Cawelo Water District.